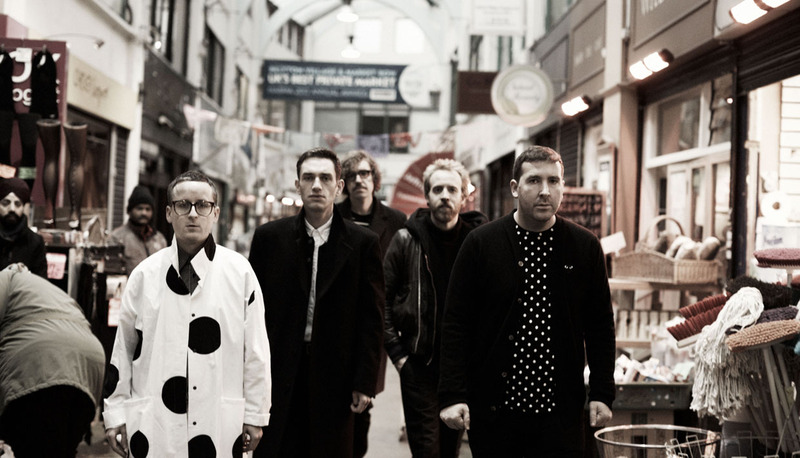 Hot Chip has kept one foot in the club and another on the charts. The band’s songs inherit their dance music backbone from diehard house enthusiast Joe Goddard, who plays alongside Alexis Taylor, Owen Clarke, Felix Martin, and Al Doyle in Hot Chip. As the head honcho of the taste-making label Greco-Roman, Goddard has launched the careers of a litany of indie acts who later crossed over into the mainstream, including Disclosure and Totally Enormous Extinct Dinosaurs. Ahead of the May 18 release of the next Hot Chip album, Why Make Sense?, we caught up with Goddard to investigate how his knack for identifying pop potential in the underground shapes his work as a label curator and a producer. Taylor Hodges: How did the decision to start Greco-Roman come about? Joe Goddard: It grew out of putting on some parties around London in warehouse spaces and various different places. They were pretty shambolic, irregular events where we would have live bands and DJs. We had the first guy who released a record at Greco-Roman, David E. Sugar, play at one of the parties. Then we said, “We should release a record,” and he agreed. Lots of the [Greco-Roman] artists played at the parties. Totally Enormous Extinct Dinosaurs played at one of the parties, and we had Disclosure play for us early on. How did you discover Disclosure and TEED? For Totally Enormous Dinosaurs, I think it was while MySpace was around. Alex [Waldron, a founding member of Greco-Roman] came across him there, thought he was interesting and asked for some music. He got some early demos, which were more club-y, more garage-y, less vocals, less kind of pop songs. And I think we found Disclosure a similar way, but maybe on SoundCloud [instead of MySpace]. Dom [Bastrya, another Greco-Roman founder] came across them there and asked to work with them. What initially appealed to you about Disclosure and TEED? I guess the thing that we’re looking for with Greco-Roman is club stuff that has the potential to cross over in the pop world, club producers who have an ear for melody and songwriting. The beginnings of that were evident in both [Disclosure and TEED]. I guess we look for unusual pop music. That’s the remit for Greco in general. Do you think weirdness generally conflicts with pop music? Well, you get pop music that’s more middle of the road. What we particularly like is pop with a strangeness to it or something out of the ordinary. That’s what we’re particularly drawn to in a club situation, something like Grace Jones or Talking Heads. That definitely came through with TEED, but I guess Disclosure is a little straighter down the line, really good vocal garage and house. But, you know, the music Hot Chip makes is all about unique pop. That’s just something we used to like to play out at the Greco-Roman parties when we were starting out, that would be a focus of the night. Do you think dance music scenes and consumers are more resistant to pop influences? Yeah, and I can understand why some people feel like that. There’s an element of the dance community that’s into the more serious side of industrial, techno and classic Detroit music. Some people, when they’re out clubbing, don’t want to be bothered by big vocals or unusual pop-y elements in the music. They like the strictness of techno. But for me, I’m just drawn toward pop vocals and sounds in dance music. I like those moments in a club when vocals suddenly feature in a track and it becomes a little lighter, more romantic and more human. That’s just a personal choice, I guess. We never tried to make Greco cooler or more underground. We’re quite open about being into the pop-ier style of dance music. That’s what we’ve been doing with Hot Chip for years, and I guess it comes from Depeche Mode, Kraftwerk, or New Order—any of those kinds of people—or from great disco records, or Inner City. Did you go to a lot of clubs where there weren’t many vocals played when you were growing up? Yeah, some. I used to go to drum ‘n’ bass things where it wasn’t too vocal-heavy, but I have to say that most of my big clubbing epiphanies and experiences were to do with music that was on the pop-ier side of dance music. I used to go to a lot of Basement Jaxx’s early parties, which were seriously house-y, but there would always be light moments punctuating the music, whether it was tracks of theirs with vocals or older vocal house things or disco records. They were quite mixed up and fun in their choice of records. Were you consuming a lot of pop as a teenager as well? Not so much. My main musical interest as a teenager was hip-hop, 90s hip-hop like Wu-Tang Clan, De La Soul, A Tribe Called Quest, EPMD, Souls of Mischief, House of Pain, Cypress Hill, alongside ’90s rock like Smashing Pumpkins, Pavement and Nirvana. I guess there probably were pop songs that I was into occasionally, but it was more rock and hip-hop and then drum ‘n’ bass. Did you incorporate any of those influences into the new record? On our last record [In Our Heads] there was one track, “Look at Where We Are,” which I felt was a successful production because it’s quite minimal. It’s basically an 808 kick drum used as a baseline, some minimal drum programming with some vocal samples, and Alexis [Taylor, Hot Chip’s vocalist] singing. Having that minimal musical arrangement left a lot of space for his voice. It felt like a hip-hop production in some ways, and since I felt like that worked really well, I used that as a sonic starting point for this new album. I wanted to make more music that had that same amount of space and groove to it, and that meant that we slowed down a lot of the tracks. There isn’t so much house music or fast disco on this new record. It’s all influenced by hip-hop and R&B. How did you get Posdnuos from De La Soul on the track “Love is the Future”? I think it was summer last year, Alexis was on tour with the William Onyeabor Band, which features Money Mark. Money Mark was friends with the guys from De La Soul, so we contacted Posdnuos through him and he was interested in doing it. It turned out great. It’s a real pleasure for us, because De La Soul is something that Alexis and I are both really passionate about and really loved from a young age. We wanted to make the link between the record and hip-hop a bit stronger as well. You said that De La Soul was a common passion for you and Alexis. Do your musical interests often overlap? Yeah, we really agree on lots of things in musical terms, I guess because we’ve known each other since we were about 12. We grew up experiencing the same kind of music at the same time. We really enjoy DJing together now and playing music and hearing what we’ve been listening to. But we diverge on certain kinds of music; he’s more interested in country and blues music, and he knows more rock and soul music. My taste is a bit more house and disco. I was interested to know how you would define Hot Chip’s sound, given that it seems to be music made up of so many different pieces, both from each of the band members and from a lot of references to different genres. I think you could say it’s a love affair with different forms of American popular music from the last 50 years or so. It’s either soul or funk or disco or house, with elements of R&B and hip-hop filtered through myself and Alexis’ experiences and our songwriting abilities. It comes out as a kind of strange pop music, which is hopefully recognizable by the way we produce it. I think there’s some kind of sonic trademark.